Joel Feder February 13, 2018 Comment Now! “Turn. Brake. Accelerate,” he said loudly into the radio. In most track situations you are told to brake hard, turn, then accelerate out of the corner. 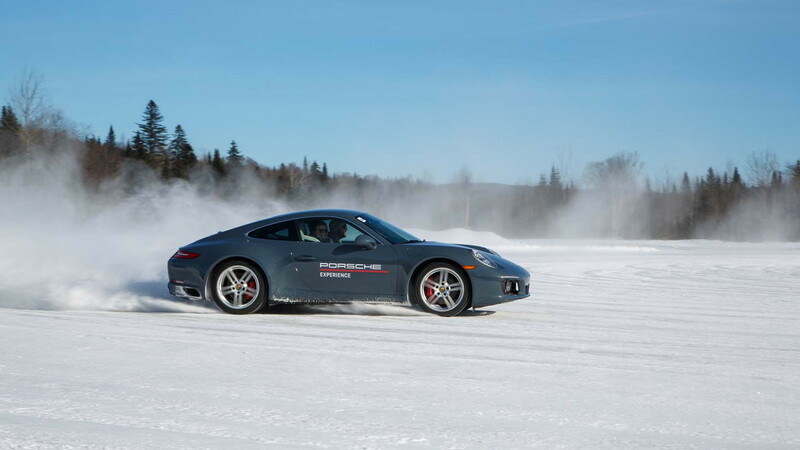 At Porsche’s winter Camp4 driving school, you are told to do the unnatural, the uncomfortable, and it makes you question your confidence. You are instructed to turn first, then brake, and finally accelerate. Porsche’s French Canadian instructors dub it TBA. As a Minnesota native, the concept of driving on ice and snow is natural to me, as is the idea of car control in slippery situations. That should make Porsche’s Camp4 a walk in the freezing cold park, right? 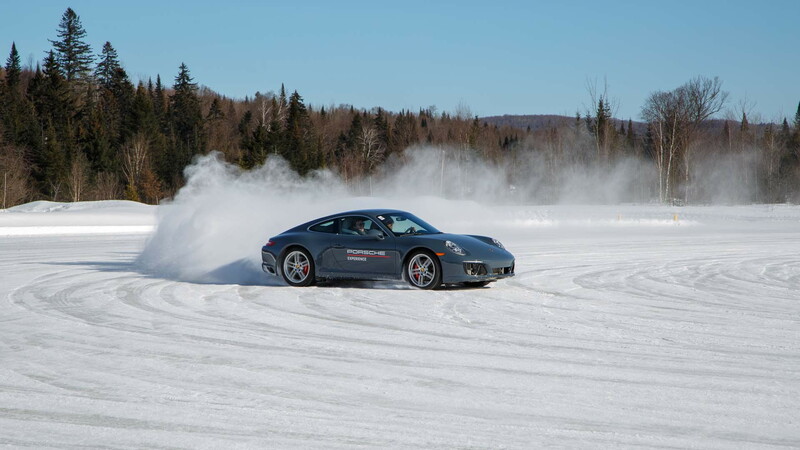 Held at the Driving Center Mecaglisse 90 minutes from Montreal, Porsche’s Canadian Camp4 is now in its eighth year. The 25-person staff at Porsche’s Canadian Camp4 ran me through four exercises, and they will do the same for 464 people during the month of February. Those exercises were: understeer/oversteer, slalom, Scandinavian Flick, and braking. None of the exercises are easy, but some come more naturally than others. 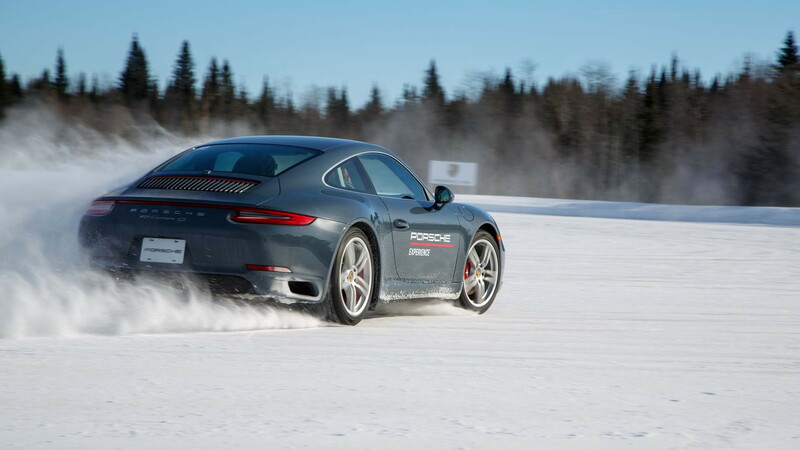 The cars Camp4 uses are 911s, rear-wheel drive Carrera S and AWD Carrera 4S models, wearing Nokian Hakkapeliitta winter tires with 1.5 mm studs to aid traction. The theme of the program is weight transfer. For best car control, a driver must realize that as you accelerate you transfer weight to the rear, and as you brake weight shifts to the front. It’s what you do with this weight that will determine how well you control a car on ice and snow. I responded by letting off the throttle to shift some weight to the front for grip, countersteering and giving it enough throttle to kick out the rear, then feathering the throttle to keep my sideways momentum. 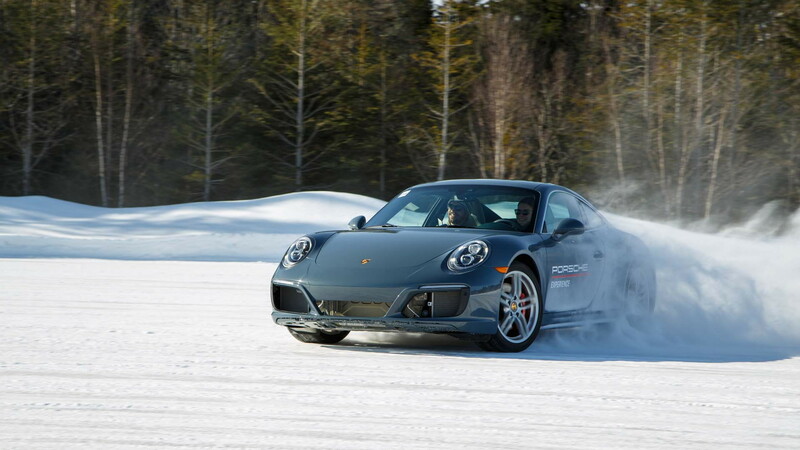 Because the 911 4S is all-wheel drive, the front tires were clawing at the ice. Once sideways, I had to reduce the steering angle of the front wheels so they wouldn’t pull me out of the drift. Loud cheers came through the radio as a massive rooster tail of snow and ice shot into the sky. The concepts of oversteer and understeer on ice are two things this Minnesota boy understands. Next on the Camp4 journey was the slalom course, but unlike other slaloms, Pierre wants the 911 4S to swing its rear end like a pendulum around the cones before drifting around a corner at the end of the slalom. The course also includes a downhill portion, and an uphill section that has another corner. Hit a cone and you owe him a beer. To accomplish Pierre's pendulum technique, I gathered speed, turned the steering wheel as I approached each cone, hit the brakes to kick out the rear end, turned the steering wheel the other way, and then hit the throttle. I did this over and over again until reaching the corner at the end of the slalom course, then drove down the hill, slid around another corner, then approached the cones again. This Minnesota boy didn’t owe Pierre a beer, instead cheers came through the radio as the silver 911 4S slid back and forth through the cones like a metronome setting the rate at which the symphony will play. Let's break that down. To take a right turn, you turn left, jab the brake hard, flick the steering wheel right and back again, hit the throttle, get into a nice drift, and countersteer. I tried that and failed. The reason was simple: Braking while turning is so unnatural to me, the wiring in my brain overrode Pierre’s instructions and I braked before turning. He reprimanded me on the radio and I did it again, and again. Each time my brain prevented me from doing as I was instructed. Prior to the second to final run, Pierre walked up to the car, said nothing, moved the position of my seat, slammed the door shut, and said “Go!” as he pointed down the track. While I thought doing it again was pointless, I did as instructed, but this time, I aced the course. The car performed a Scandinavian Flick flawlessly as it drifted around the 90-degree turn. Why? Because Pierre’s seat adjustment changed my steering input angle, allowing me to turn the wheels farther than before. That, and he screamed at me over the radio to not brake before turning. Finally came the braking exercise in a rear-wheel drive 911 Carrera S. Once again I was instructed to turn, brake, and accelerate, only this time it was to induce oversteer around a half circle. Once again, my brain’s wiring refused to want to turn then brake, making it hard to flick the rear end out as instructed. However, oversteering wasn’t an issue as I drifted around the half circle once the tail was loose thanks to judicious use of the throttle. That use of throttle was much to the chagrin of Pierre as I was supposed to be shifting the car’s weight by turning and then applying the brakes, not throttling my way into a drift. Before it was time to go home the instructors (all professional drivers with colorful histories in racing at places like Le Mans) hopped into the 911s to give the students a snow and ice hot lap we wouldn’t soon forget. The squeamish might need to pass on this experience; it’s not for the faint of heart, but it’s a heck of a lot of fun for those who appreciate watching a great driver make a car dance. After a full day experiencing Porsche’s Camp4, it’s clear it doesn’t matter where you come from or what your experience; it’s hard to relearn ingrained techniques to achieve the best car control on snow and ice. That doesn’t matter, though, because the team at Camp4 can help anyone learn some fun and useful techniques...even this sometimes thick-headed Minnesota boy sometimes known as Yo-el.